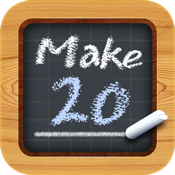 Make20 is a new style number puzzle game. ﻿﻿﻿It is about how fast you can add and subtract numbers. ﻿﻿﻿Try it to exercise your brain. ﻿﻿﻿I am sure you 'll be into it. Click the numbers to make 20. Which is faster, your finger or numbers?